Border Police officers locate terror suspect in Palestinian Arab taxi at the Shiloh Junction. Border Police officers on Friday arrested a wanted Palestinian Arab terror suspect in Judea and Samaria. The officers stopped a Palestinian Arab taxi for a routine inspection at the Shiloh Junction, north of Ramallah. When one of the passengers aroused their suspicion, they searched his body and found that he was in possession of a gun and bullets. A further investigation revealed that the man was wanted for questioning by the Israel Security Agency (Shin Bet). He was arrested and taken for further questioning. 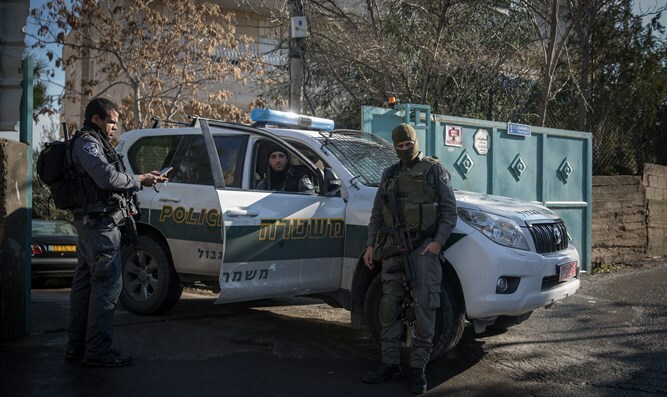 Earlier this week, the Shin Bet, IDF, and Israeli police arrested a terrorist cell which had carried out seven firebomb attacks on vehicles travelling Highway 443 and Highway 436 near Givat Ze'ev. Indictments against the members of the cell were submitted to the military court of Judea, along with a request that the detention of the suspects be extended until the end of the proceedings.